Our group will also be traveling to sites throughout the West Bank and Israel to visit with leaders of the Palestinian nonviolent movement and Israelis who show solidarity with them. I am thrilled to be taking this trip together with dear friends who I have long known though our activism for a just peace in Israel and Palestine. I will blog as much as I can about my experiences from the ground and upon my return. Please stay tuned! This entry was posted in Bil'in Solidarity Delegation 2013, Global Activism, Human Rights, Israel, Nonviolence, Palestine on October 19, 2013 by Rabbi Brant Rosen. Sounds terrific. I’d love to go on the next one. Awesome! God speed. Know that many hearts travel with you and join you in this endeavor. I look forward to reading your insights and your group’s experiences. We will pray for your safety and that of the villagers. We can only hope that what you relay back regarding your trip here will result in people having a greater understanding for what is really happening and that they will feel compelled to encourage their political representatives to take a better look at what needs to be done from the U.S.
I’m still kicking myself that I couldn’t meet you. There is excellent chocolate cake in Bethlehem that needs to be eaten to be believed, and you might not find it without assistance. (It’s in Sima’s Cafe on Manger Street – say hi from me to Sima and Hind if you find it.) That cake is an essential restorative after tear gas and it’s worth crossing many checkpoints for. I hope you’re having a wonderful trip and that you’re able to drop in on my host family if you get the chance. I find this interesting, in the midst of what appears to be serious peace talks. Perhaps a solidarity trip to Syrian refugees, the 2 million of them, would be more inspiring. Rabbi Rosen, perhaps your group really doesn’t want any agreement (I am holding my breath) between Israel and the Palestinians, as this would result in a two state solution, unacceptable to J.V.P. and others. If peace actually transpired it won’t change your minds, but might force you to reconsider why your definition of humanitarianism is to help out every race, religion, and ethnic group except mainstream Jews. Don’t you think that hungry Jews, enough of them in Israel living below the poverty line (and certainly some Israeli arabs), are worthy of your attention and donations, too? Roz, a question. When American rabbis visit Israeli Jewish communities in need and offer them support, practical and spiritual (as they do – there are several religious organisations catering to deprived people in Israel) do you comment on their blogs criticising their actions and telling them it would be ‘more inspiring’ for them to visit Syrian refugees? If not, why not? After all, Syrian refugees are in far greater need than anybody in Israel. 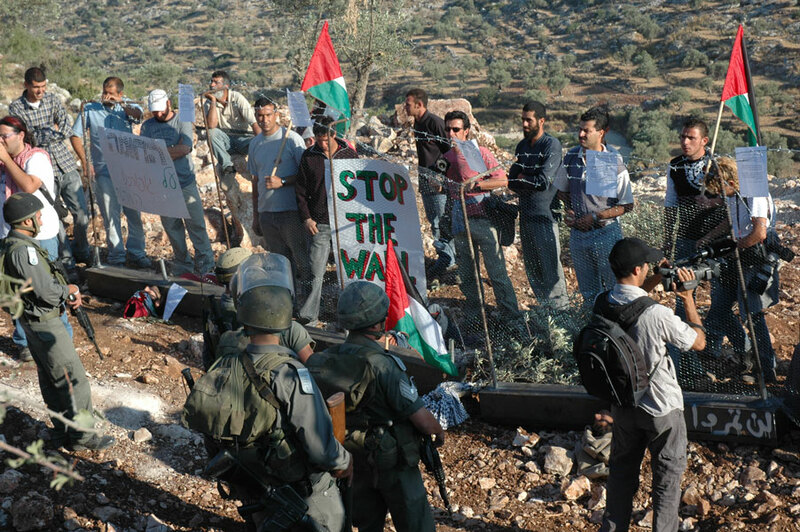 Have you written to Yad Sarah to ask them why they’re not operating in Amari camp? I would also like to ask you what you personally have done to help Syrian refugees. Have you done anything, or are you only concerned for them insofar as you can use them to rebuke Brant? It seems that your real issue here is what you perceive to be Brant’s lack of concern for ‘mainstream Jews’ – in other words, people like yourself. As a congregational rabbi in Evanston, Brant devotes most of his working life to helping people who are what you might term ‘mainstream Jews’. One of the best services any religious leader can perform is to draw the attention of the mainstream to the plight of the people on the margins, who are being neglected and left behind, the people who are considered not important enough to bother about because they are not of the right ethnic group or religious community. Syrians are often used as an excuse not to care about Palestinians, and if there were no slaughter in Syria, the decoy would be people in Somalia or Afghanistan – people anywhere but here, people anywhere but where Brant is. Because those people aren’t suffering enough. Those people make us politically uncomfortable. Let’s not look at those people. Most Israeli Jews don’t have to look. They will never see a resident of Bil’in, and of those who do, most will meet them only at the other end of a gun barrel, so it seems extraordinary to me that you would accuse people who go in and actually make a personal connection as not wanting a peace agreement. Jewish solidarity visits are very important because I am able to take unwell, fragile, and traumatised children to play with these guests and learn about Jewish life and heritage from people who do not carry guns. Otherwise the only Jews they are likely to meet will be those ones who burst into their bedrooms and dragged them out of bed at gunpoint in the middle of that night. I have a Dutch colleague, married to a Palestinian woman, whose enduring memory of his daughter’s first trip to the sea (aged four) was her coming home and excitedly telling her mother (who hadn’t been allowed to go), “I played with the children of the army.” I remember the late Rabbi Froman discussing Judaism with people who were accustomed to seeing the Magen David above checkpoints, checkpoints where they were all packed into narrow metal cages for hours at a stretch, and who were more likely to associate menorahs with state symbols seen in interrogation centres than they were to think of light. No, their situation is not as bloody as Syria…but are you really qualified to tell these people, from the comfort of your computer chair, how many more people like Fil Abu Rahmeh have to die before they are entitled to these gestures of solidarity and understanding, without you coming in to criticise? Jordy, Palestinians were living under military law and all the punitive restrictions that this entails long before the Intifadas. Military rule also applied to Palestinian citizens of Israel nearly two decades, beginning in 1948 and only being fully lifted in 1966 – there was one rule for Jewish citizens and another rule for them. The restrictions on movement aren’t new: as I often point out, the prototype for the checkpoints in Bethlehem can be found in Majdal and ‘Ajami after the state of Israel was created, where those Palestinians who hadn’t fled or been expelled were forced to live behind barbed wire for two years. To get to work every day the chosen labourers were processed through checkpoints. They had committed no crime and they posed no risk. This did not stop groups of Majdal residents from being taken through the checkpoints, loaded onto trucks, and deported to Gaza, which happened periodically from the state’s creation right up until mid-1950 as the authorities felt that the Arab demographic in the area was still too great. This is what you find when you trace back the history of checkpoints in the region, not some security crisis. And even if there had been a security crisis, that would not excuse the abuses that military law makes possible, such as detention without charge or trial or the violation of international law on children’s rights. I know the communities that Brant is visiting on this trip very well, and in visiting the Abu Rahmeh family and going to the Nasser farm he is hardly palling around ‘the ignoble anti-Semitic forces of the world’. These people are not the sworn enemies of anyone – the Nassers have actually put a sign outside their property (under threat of army confiscation – they are banned from using mains electricity, having piped water, or building permanent homes despite living there for well over a century) that reads ‘We refuse to be enemies’ in Arabic, Hebrew, Yiddish, and English. These communities are facing actual physical destruction, either through demolition (the terrible fear hanging over my own host family right now) or slow confiscation and attrition (as is occurring in the seam zone). This is why it always seems deeply ironic to me when people accuse the inhabitants of these places and their helpers of scheming to destroy anywhere. There is some graffiti on the separation wall near my house that sums it up well: “To build your world you destroyed theirs.” I would also pause here to question what it means to be a Jewish state – is a state that is built on the back of ongoing forced displacement really Jewish, in any ethical or spiritual sense? I place a lot more trust in people to safeguard their religious and ethical principles than I do in any state to do the same, which is why I look on Brant’s trip as religious activity. A person can look another person in the eyes; a state can’t. Sometimes it seems that people risk falling into a kind of idolatry of the state – they are so passionately attached to a national identity that human lives take second place, and anyone actually engaging with the people who live those lives becomes some fearsome traitor. We saw this in Belfast recently, when loyalists were so enraged by the city hall’s decision not to fly the Union Jack every day that they went out and petrol-bombed a Catholic church that happened to be hosting a children’s party at the time. There were thousands of people fighting in the streets. Some notion of ‘being British’ all of a sudden became more valuable than those children and the others who were targeted that week. It is clear from some of the comments here that protecting the concept of Jewish nationhood is far more important than challenging what is happening in Bil’in, and never mind that Subhiya Abu Rahmeh has two dead children now. It all comes down to what you’re going to prioritise in the end, a flag or a person. National identity is obviously important to many people, but it should not be so important that a rabbi can’t visit Bil’in without people speaking as though he is off to afternoon tea with Field Marshal Goering.